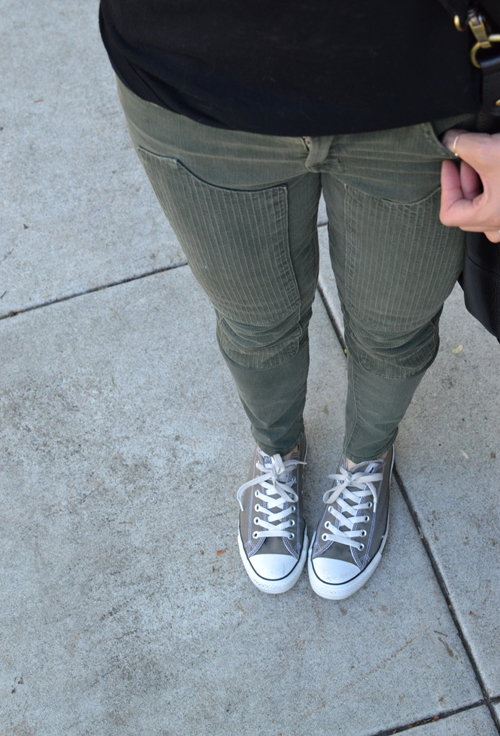 Skinny moto jeans, a soft black sweater and a pair of chucks is my favorite new casual outfit combination. Throw in delicate jewelry and a slouchy cross body bag and I'm one happy girl. So easy and so comfortable. Like your pants. The style is pretty cool. Love this look. It's good to sometimes just throw on a sweater, pants, and sneakers and call it a day. Perfect. This is such a good color combination! Love those jeans! I love the detail of your bottoms! super cool...and been looking for sneakers, might just have to pick up some chucks! Love those jeans! J Brand is made in the USA, too, which always makes me happy. They look great with cons. Love the jeans...totally nailed a cool casual look.